Truth by Kbaig: Echoes of Unjustifiable Indian Captur of Kashmir! Echoes of Unjustifiable Indian Captur of Kashmir! The views expressed by Indian female Professor on the Social over Indian Capture of Kashmir has started a new discussion in the Indian media. 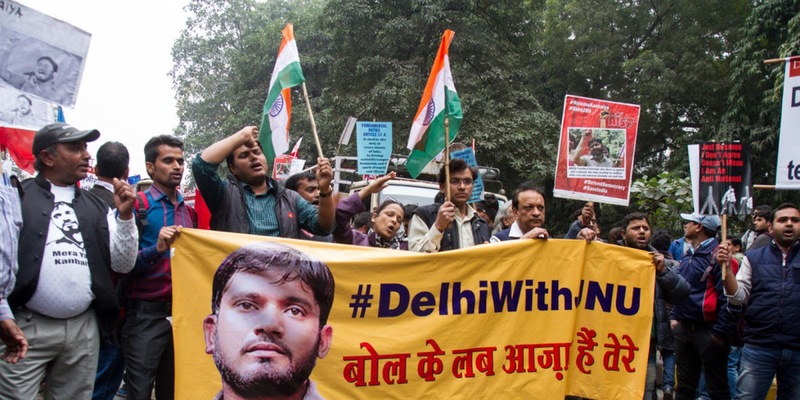 This started from the arrest of Union Leader Kanhiya Kumar of Jawahr Laal Nehru University for supporting Afzal Guru and commemorating his hanging. This spread to the 40 universities of the India. Including Kanhiya Kumar many Indian students consider Afzal Guru as innocent and his involvement in attacks over Indian Parliament in 2001 as fabricated and propaganda of Indian govt. 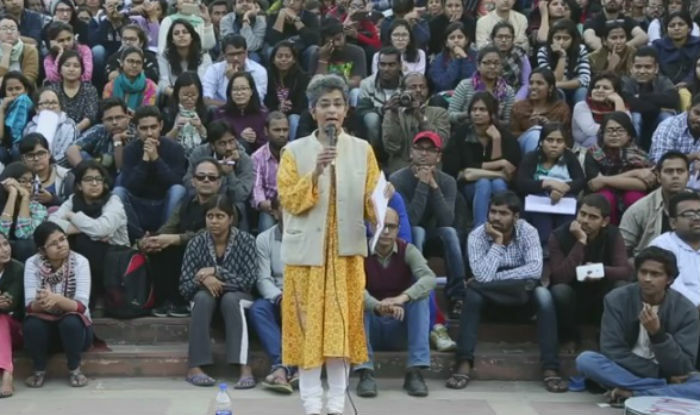 Kanhia Kumar has repeated the same stance that Indian media represents in its analysis articles or Talk Shows that Afzal Guru was sentenced to death without completing the legal requirements and providing solid evidence. He was hanged in the dark of the night without giving his legal heirs last opportunity to see him. His dead body was also buried within the jail premises as well. 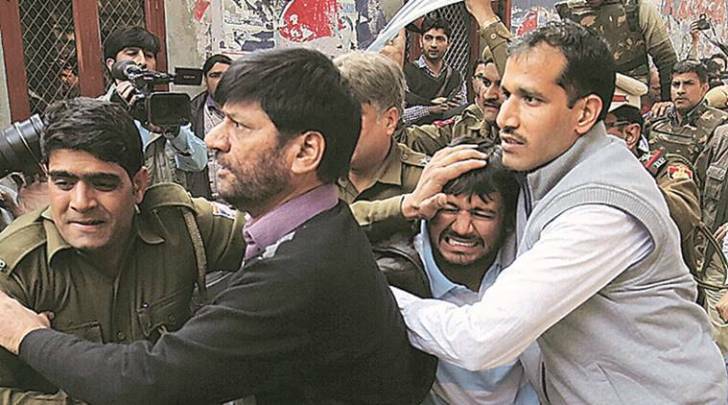 The situation might not have been worsened so much on the arrest of Kanhiya Kumar but as Hindu extremists, BJP and Shiev Sina took it as a problem of their ego that a Hindu student dared to support Afzal Guru. Due to such reaction of Extremist Hindu govt. 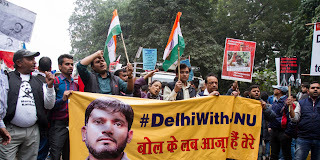 student unions within the whole India started protests against the arrest of Kanhiya Kumar and support for freedom of Kashmir from India was observed as well. On the one hand Hindu extremist govt. tried to crush the protest of students through force while on the other hand attempted to fuel the extremist Hindus by alleging Kanhiya Kumar for hoisting Pakistni flag and burning the Indian flag so that extremist Hindus attack him during his trial in the court. When students of Jawahar Laal Nehru University got these reports they also arrived in the court premises where a huge number of media persons was present as well. The member of BJP govt. O.P. Sharma veiled himself as lawyers along with other Hindu extremists and reached in the court and started beating the students. Media persons covering this scuffle were also beaten as well by Hindu extremists. Police present on the spot did not stop the fake lawyers beating students but those students who dared to resist were apprehended for violating the peace in the court premises. Hindu extremists did not stop here but announced as well that whoever will kill the Kanhiya Kumar alleged for supporting freedom of Kashmir he would be granted 1.1 million rupees. Posters have been pasted in the various parts of the New Delhi. Another member of BJP has announced 0.5 million rupees for the one who will cut the tongue of Kanhiya Kumar. When journalists asked that leader of BJP for cutting the tongue, said leader replied that as Kanhiya Kumar has disrespected Modi thus it is necessary to cut his tongue. On the manhandling of University students by extremists Hindus and Police, Professors of the universities have got violent as well. They have announced to take out rallies and protest against he arrest and allegations over Kanhiya Kumar as well. In connection with this protest, Professor Niveditiya Menon of Jawahar Laal Nehru University famous as scholar not only in India but internationally as well has termed Indian capture of Kashmir as illegal in a big protest rally of the students. She had made it clear to the audience with arguments that India had promised in the UNO that Indian forces will withdraw from Kashmir after restoration of peace in the result of withdrawal of Paksitani tribal forces and Kahsmiris would be given the right to decide their fate and if Kashmiris decide to be the part of Pakistan, their decision would be accepted as well. Now the situation is that India is prolonging her capture of Kashmir through her forces and not ready to give the promised right of Kashmiris to decide their own fate through referendum. She termed Indian capture as injustice to Kashmiri people. She gave the example of Juna Garh whose Raja (ruler) was Muslim but majority of the population were Hindus therefore India captured Juna Garh but India is not ready to accept the same principal in case of Kashmir and entered her forces into the Kashmir. She said that Indian states like Manipur, Nagaland, Chatisgarh etc. are being kept under the control through use of violent force while people of these states are not ready to live with India. People of these states consider Indian forces as occupying forces. She also told the students that whenever famous Western newspapers etc. like Newsweek or Time publish the map of Indian they show Kashmir as a disputed land not the part of India but such editions are not allowed for selling within India.